as sacred as prayer, as essential to the spirit as food to the body. 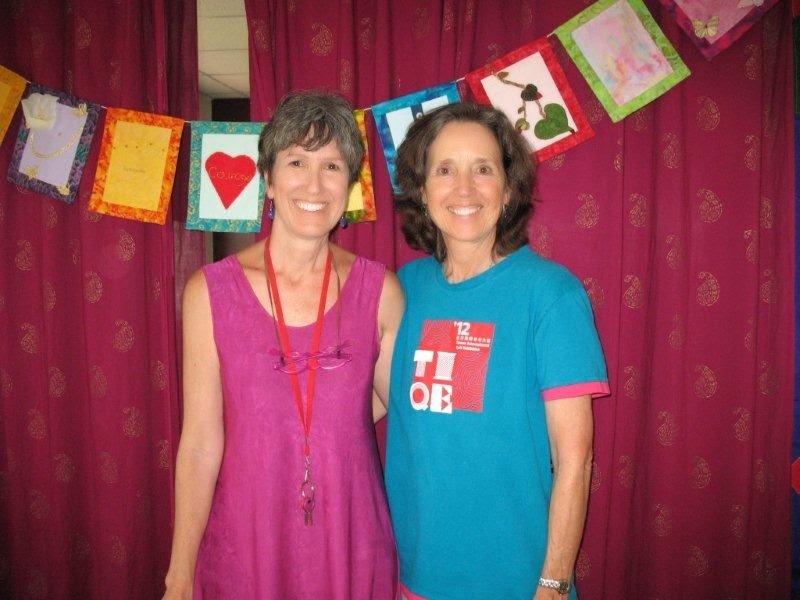 We began with some reflective exercises to help bring our bodies and attention to being present and open. 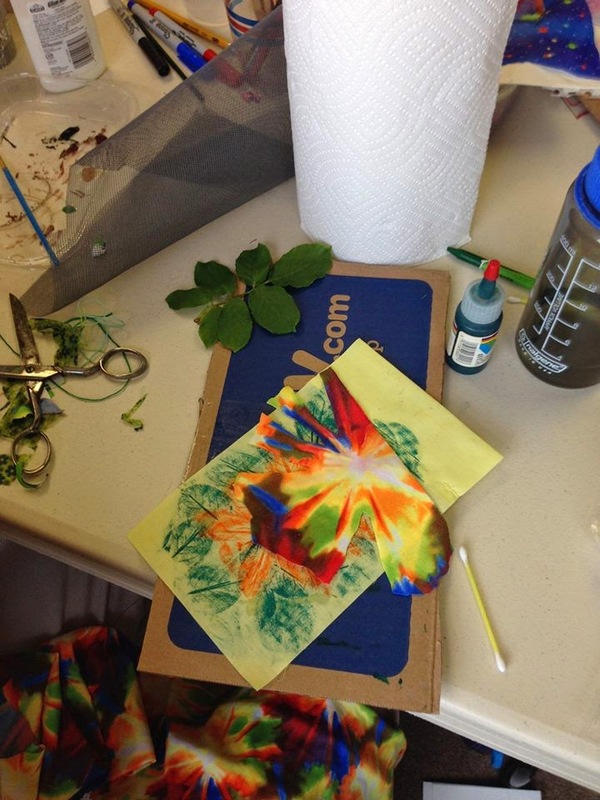 Following some creative warm ups, it was on to fun flag making with mixed media. 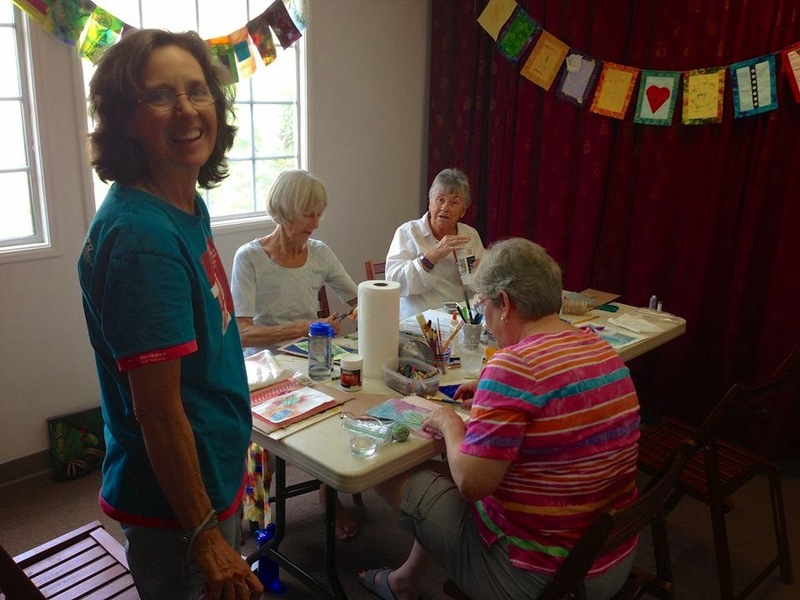 Working at their own pace, everyone seemed to enjoy the process using paint, buttons, feathers, glue, thread and more. Lively conversation ensued as we got to know each other. 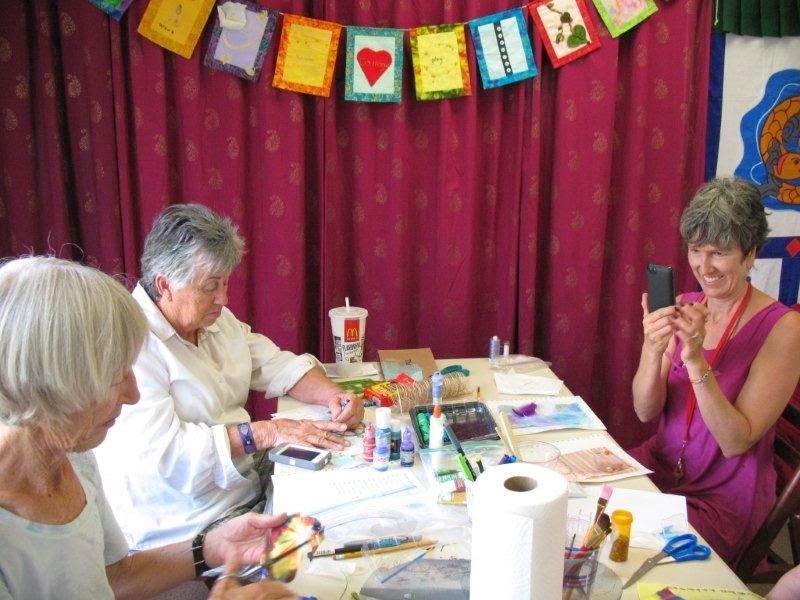 Thank you Ladies, for choosing to spend your Saturday making art. 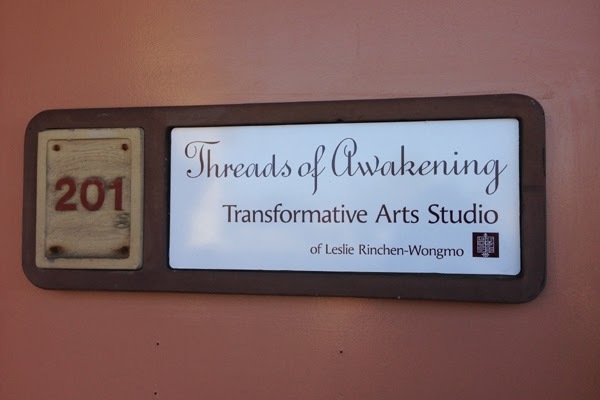 A big Thank You to Leslie for graciously welcoming us to the wonderful Threads of Awakening Transformative Arts space! The flags seem a natural fit for the space. 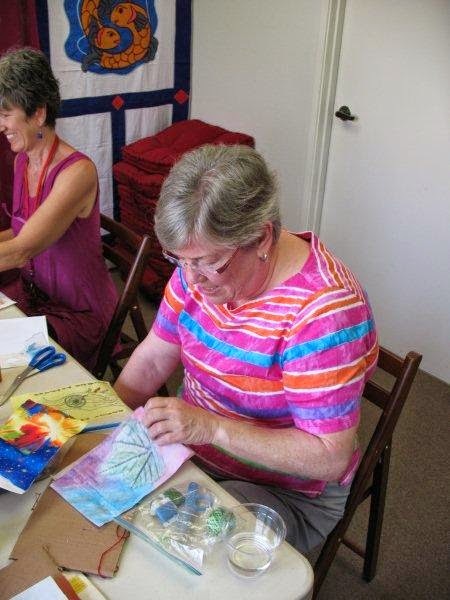 Look for more flag workshops at the studio coming in the future. 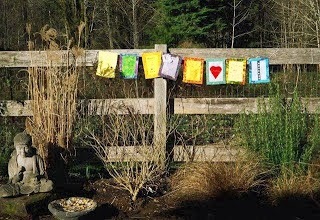 Several prayer flags... and more to share in the upcoming workshop on techniques. 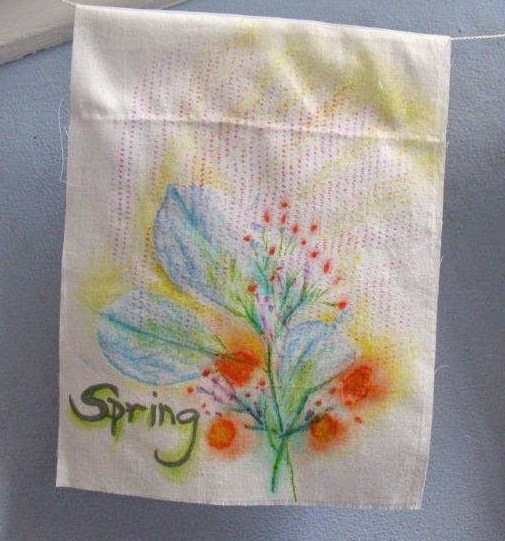 For these two I used tea bags to make leaf rubbings, then appliqued the paper to the hand dyed cotton flag. 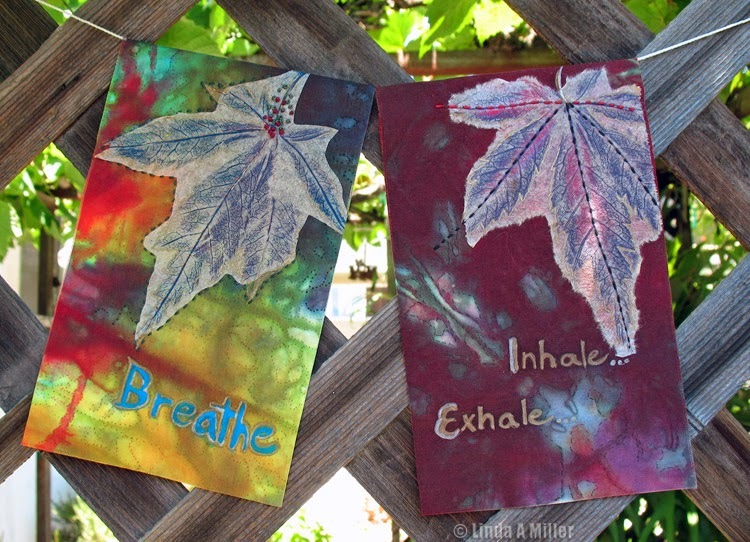 Breathe, inhale and exhale are all reminders to stay present. 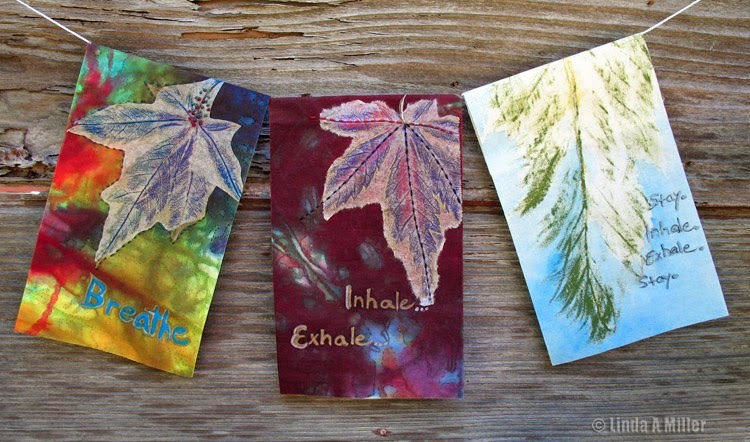 The third flag addition is a leaf rubbing directly on the fabric with oil sticks, paint added later... and writing (Stay, Inhale, Exhale, Stay) about staying with the breath in the present. Where I am living at the moment, and relishing it. so we can keep them open to what is most difficult. 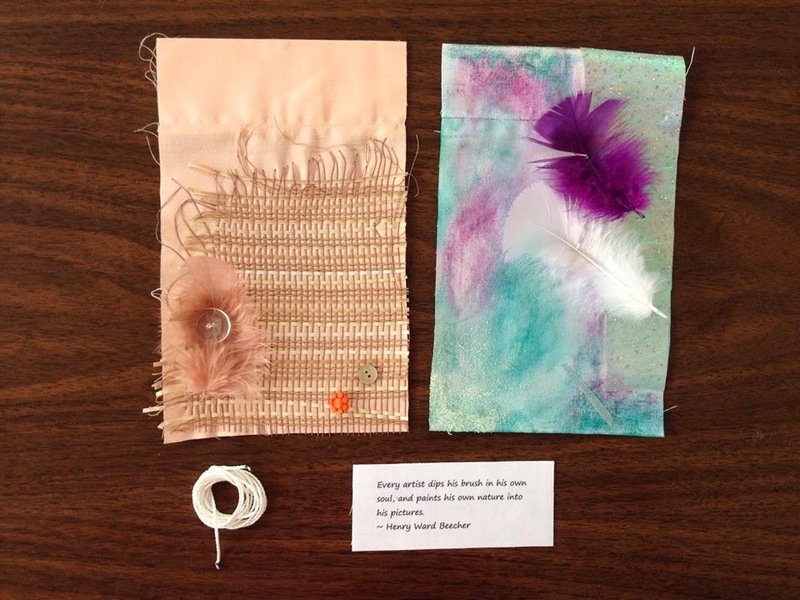 In preparation for workshops, I have been researching healing traditions related to the prayer flag. I had been curious if prayer flags were used historically within our western culture. An interesting discovery was the "Clootie" well, derived from the Scots word for cloth or rag. 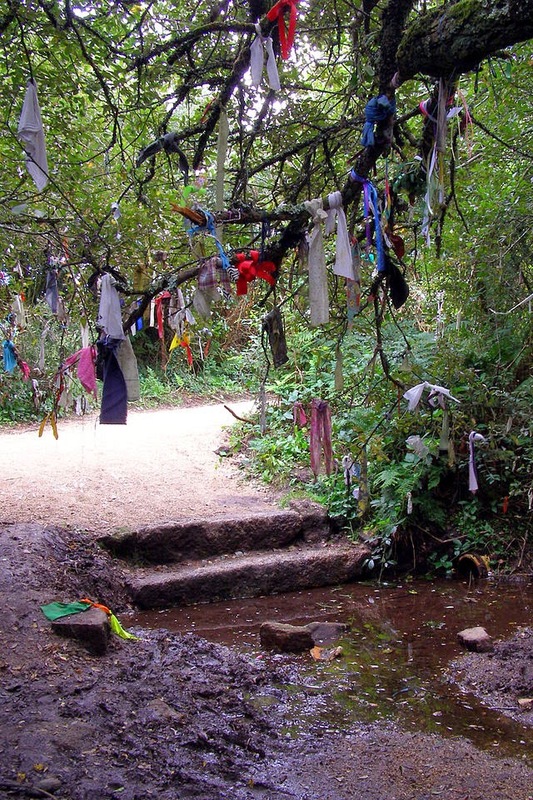 In Celtic areas these places of pilgrimage are wells or springs, often with a neighboring tree, where strips of cloth or rag have been tied to the tree's branches as part of a healing ritual. 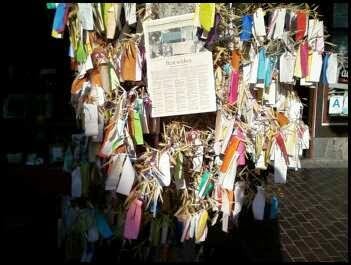 Worldwide down through the ages wish tree traditions have existed, using all manner of materials as offerings including fabric, coin, or paper. Japan has a strong wish tree culture. In 1990's Yoko Ono began using the wish tree in her work in exhibitions shown internationally. People have been invited to write their personal wishes for peace and tie them to a tree branch. More wish tree links here. 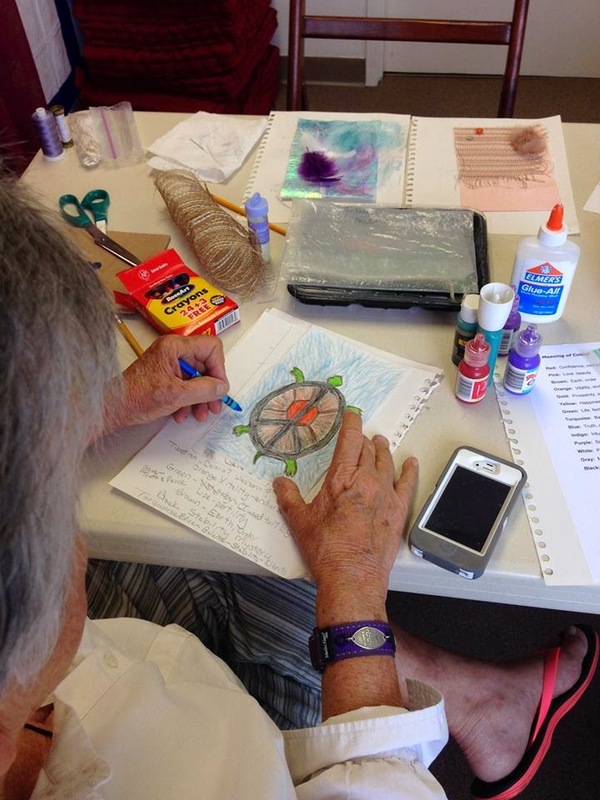 What better way to send healing than through art! 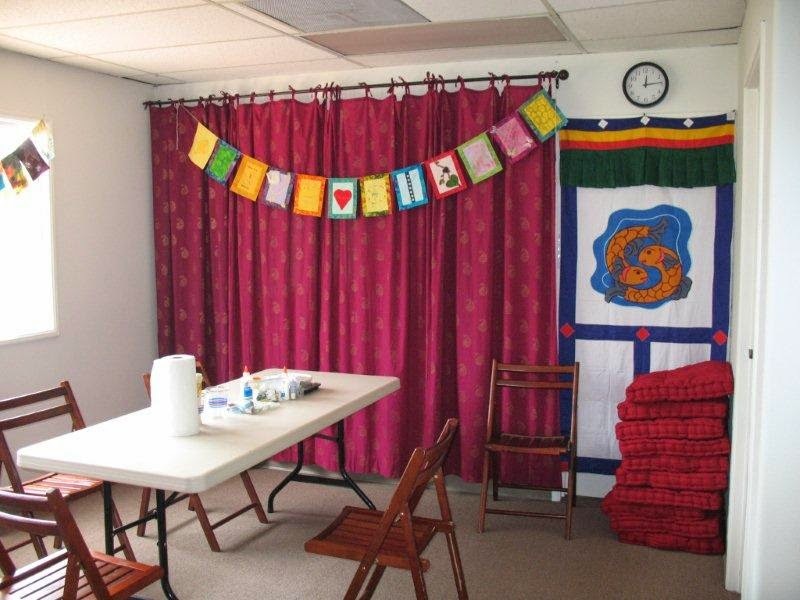 As for actual prayer flags, their origin is believed to have come from India and the Shakyamuni Buddha, whose prayers were written on cloth banners. They were introduced into Tibet about 800 CE, with widespread use of printed flags beginning around 1040 CE. Have you heard of other traditions? Please let me know about them! 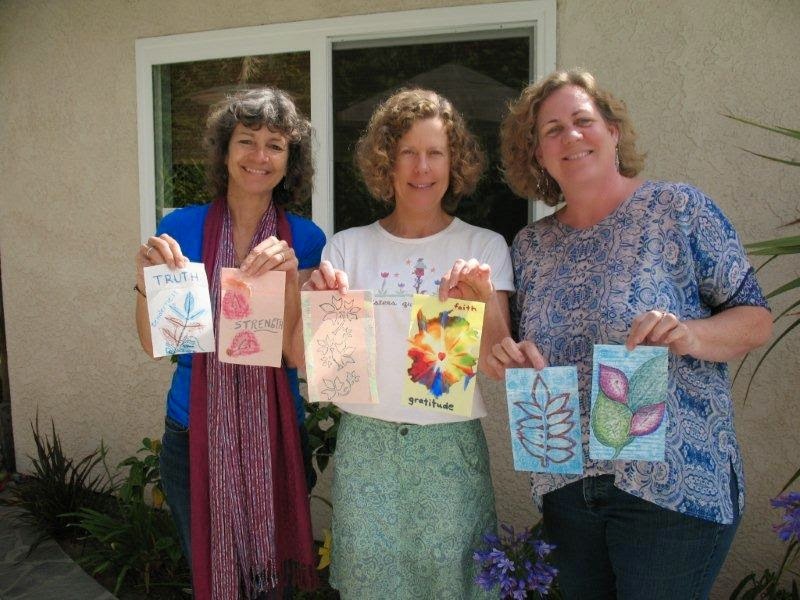 Sharing this picture from last weekend's prayer flag workshop... a pleasure to be with these ladies! With links to the April workshop, too, in case you missed it. I will be teaching this Creative Circle Workshop in Oxnard on July 26th. Creative process allows us to make new discoveries about ourselves and our world. 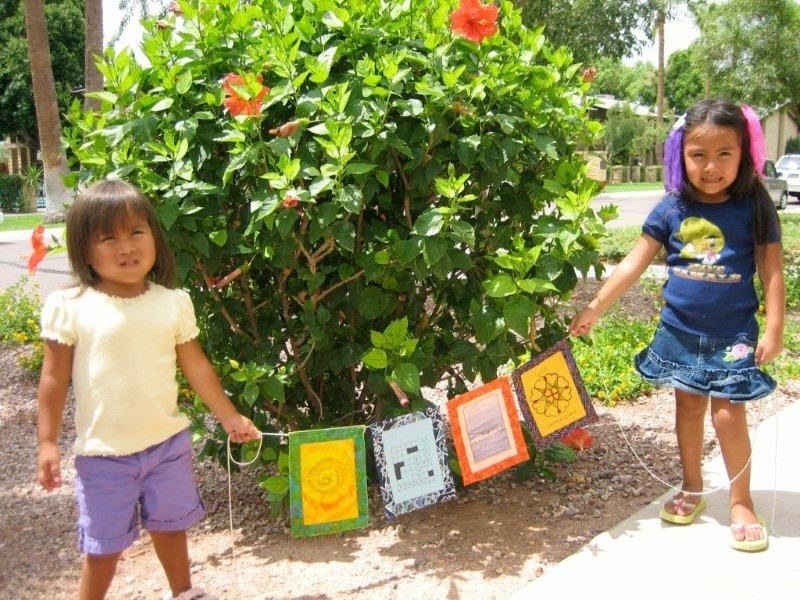 Join in this hands on exploration using simple and fun techniques to create your own prayer/aspiration flag. These flags cross cultural and spiritual boundaries in order to share positive energy with others. Let the day be your celebration of renewal. No experience required. Blank flag and supplies provided. Please contact me with questions or to register. Cindie Wolf recently passed away. 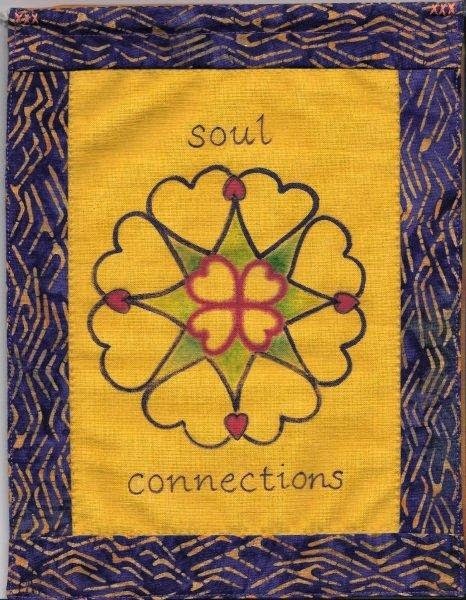 We remember Cindie with her beautiful Bhavana Project contribution, Soul Connections. She worked on the flag in Spring 2007. Our condolences go to her family. May she rest in peace. The courage to give yourself permission. The courage to allow your work to be something you didn't expect or to take you places you did not expect to go. The courage to go there. It was a reflective and light hearted day. Thanks to Buster's for hosting us. Join us next time! 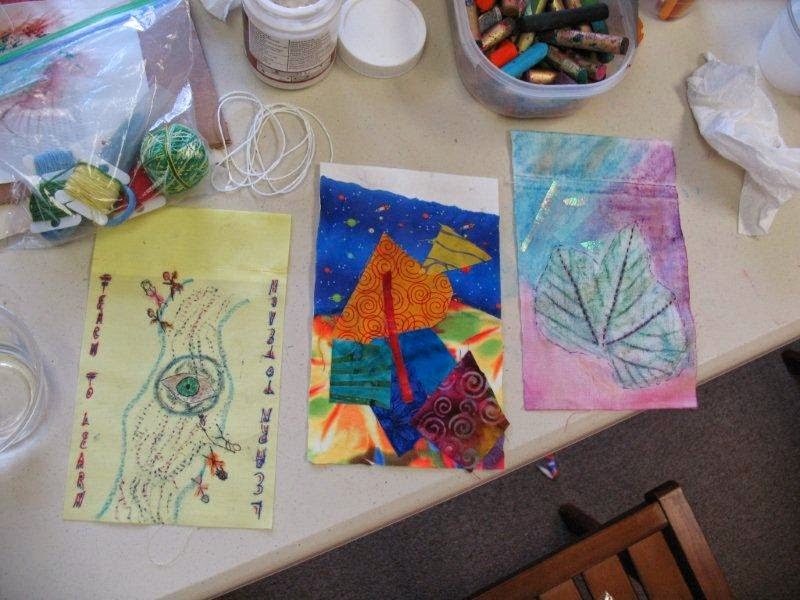 Play, relax, and create a prayer flag! Creative process allows us to make new discoveries. So, are you ready for an art adventure? 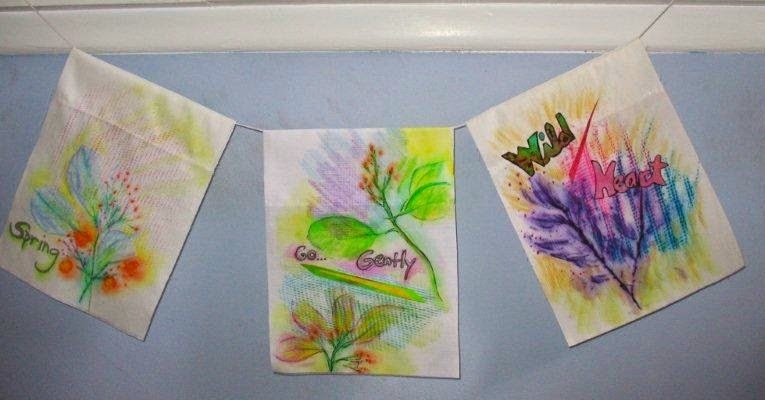 Join in this hands on exploration of simple and fun techniques while making your own flag. Let the day be your spring renewal. 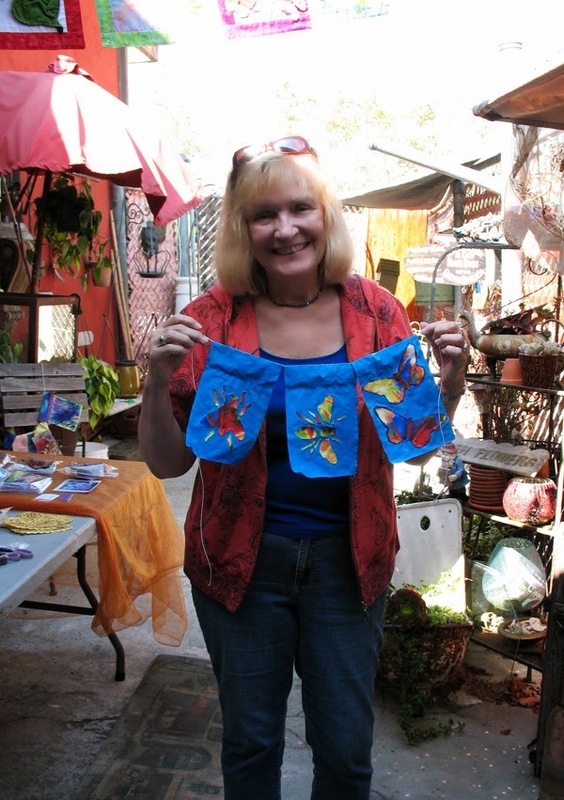 Open to all levels, no art or sewing experience needed. Blank flags and supplies provided. 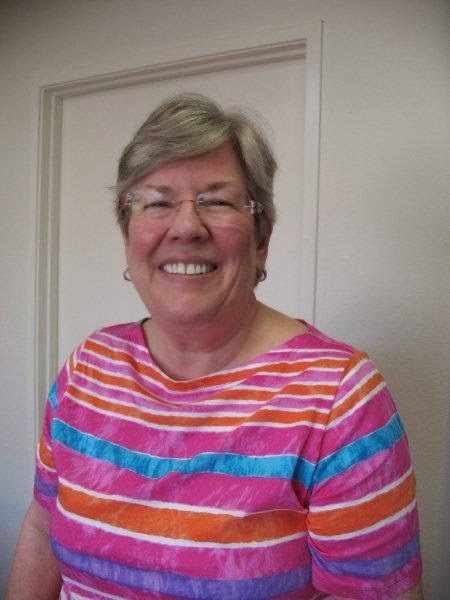 Contact Linda with any workshop questions. 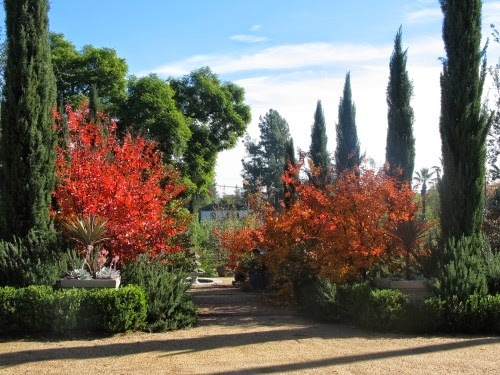 The February 2nd workshop has been postponed, to be rescheduled in spring, so stay tuned! Do you have something to express or share? Join in this flag making circle, and see what evolves. Creative process allows us to make new discoveries about ourselves and our world. Are you ready for an art adventure? 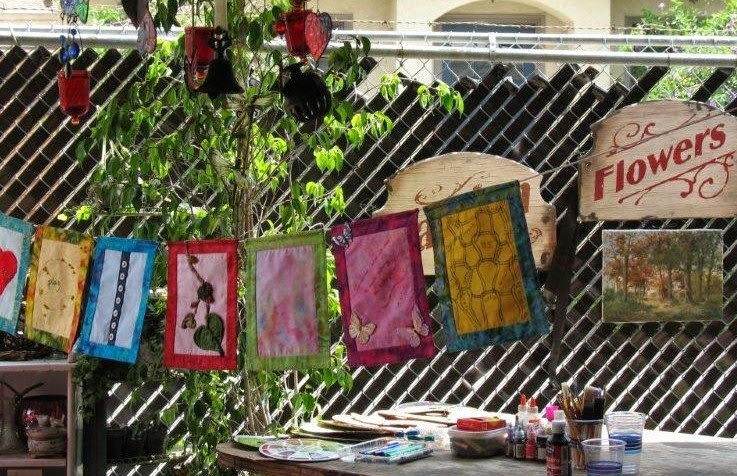 This workshop will consist of hands on exploration of simple and fun techniques while making your own prayer/aspiration flag. 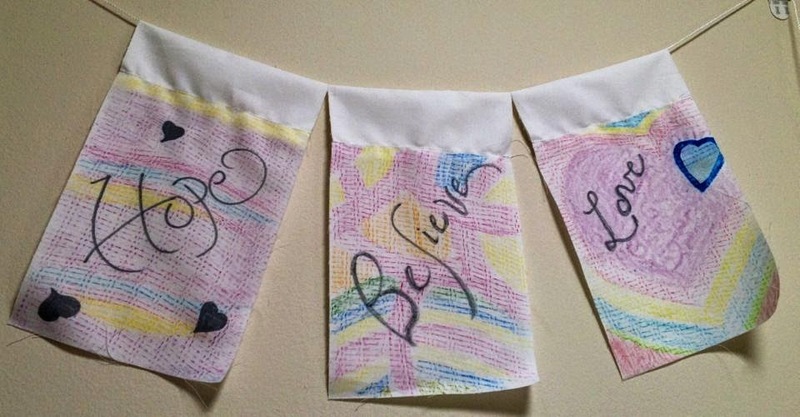 These flags cross cultural and spiritual boundaries to share expressions of positive energy with others. Let the day be your celebration of renewal. Open to all levels, no art experience needed. Materials provided. Do you have something to express or share? 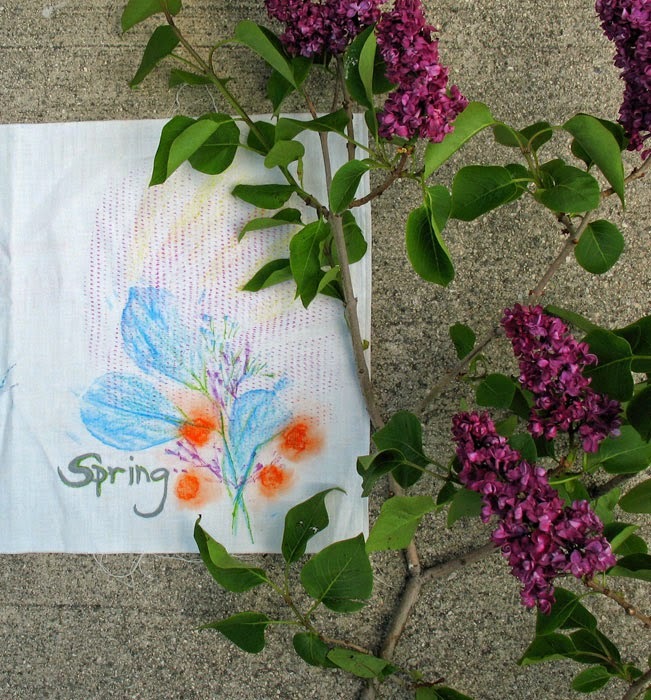 Join in this flag making circle, and see what evolves!